Our official recipe for the classic cocktail, virgin or not, uses V8 and just enough lemon, Worcestershire and hot sauce to make it soar, but not overwhelm. 1 In large glass or plastic container with lid, stir together juices, Worcestershire, zest, pepper sauce and pepper; mix well, cover and chill. Do not mix more than 3 hours ahead of serving. CCP: Serve beverage chilled to below 40 °F. 2 For Each Serving: Fill 16-oz. glass halfway with ice and top with 1 cup Veggie Bloody Mary mixture. Mix in 1/4 cup vodka, if desired. Stir to mix. Garnish with celery stalk and serve. 1. In large glass or plastic container with lid, stir together juices, Worcestershire, zest, pepper sauce and pepper; mix well, cover and chill. Do not mix more than 3 hours ahead of serving. CCP: Serve beverage chilled to below 40 °F. 2. For Each Serving: Fill 16-oz. glass halfway with ice and top with 1 cup Veggie Bloody Mary mixture. Mix in 1/4 cup vodka, if desired. Stir to mix. Garnish with celery stalk and serve. Serving Options: Drink may also be made with gin or light rum at the ratio of 1/4 cup liquor (Vodka, Gin, Rum, etc.) to 1 cup Veggie Bloody Mary mix. Mixing Options: Horseradish may be added to this mixture as well as any variety of bitters too. 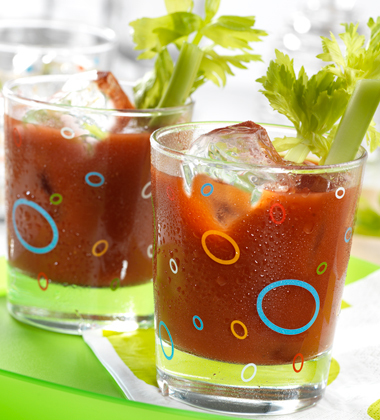 Substitutions: V8 Spicy Hot Vegetable Juice, V8 Low Sodium Vegetable Juice or Campbell’s Tomato Juice.